Last week we were told the upsetting news that Hannah is no longer welcome at IST and that there is not a place for her after the half term, which is in two weeks. This news came as a complete shock to us as although there have been some settling in issues we thought that Hannah was dong really well. She was progressing academically, making friends and enjoying the school environment. This had been the third time the meeting was scheduled as both weeks previously it had been cancelled as the Principal was unwell but I was not told so turned up for the meetings both times. I was also told the meeting was to discuss the results of some testing and provision for Hannah. So of course I was caught completely unaware and also James didn't come as we did not know what the meeting was about. The reasons we were given for her dismissal is that based on the tests that the school psychologist did with her over two sessions, Hannah is performing cognitively at a 4-6 year old level in some areas. Apparently as she is performing at a much lower level then her class mates then she can not be accommodated in the classroom. We never expected Hannah to be doing the same work as her classmates but instead had expected that the curriculum would be adjusted to Hannah's level so that she could do work at her own level but in an inclusive classroom environment. It also makes me wonder why at christmas time when she had only been at school six weeks with me when the class was split due to rising numbers, without any consultation with me, Hannah was put in the older class with a new teacher in a new classroom. They say that Hannah needs specialist teaching and a life skills programme and a team of specialists to provide for her. In a mainstreaming environment those people are actually the teacher, the principal, the special needs teacher and the teacher aide, all of who are at IST. 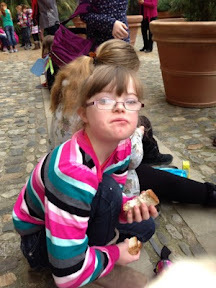 We wanted Hannah to be mainstreamed not segregated and taken out of classes for lessons. The other reason I was given was that my expectations for Hannah to be at school for lunch time and some periods of the day without a teacher aid were unrealistic. The principal said that she was legally responsible for Hannah and if anything happened to her at lunchtime while she was unaided then it would be legally her fault. Is that not the same for all children? Isn't she also legally responsible for Jasper and Penelope, so what is the difference, is this just not blatant discrimination? So we have lost the battle with IST and not only does Hannah no longer get to go to the same school as her siblings and her friends but the children in her class who have formed relationships with Hannah learn that at IST if you are different you don't belong - is that really the message a school should be sending to the children? 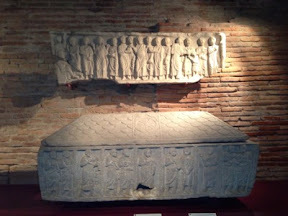 Last Thursday the year 5 and 6 classes went on a field trip to a musee in Toulouse. I was asked to go as a parent helper even though our teacher aid was going with Hannah. Still unsure why I needed to go as well although maybe it was so that I could see for myself the issues with Hannah. Instead I saw the complete opposite. Hannah sat and listened to the teacher talk about the Toulousian ruins and the sycophucus tombs that had been found in the area. When talking about one tomb which had carvings of the disciples on it the teacher asked what it was about. Children put their hands up and said it was about Jesus and then there was a discussion about what Jesus did and who he was. Hannah out her hand up and eventually the teacher asked her and she said that "Jesus died on the cross". At that point I wondered how the school could justify their reason for kicking Hannah out of school as that she is not able to do the same work as the other children. Sure her sketches of the tombs may not have been as detailed as some of the others but she still drew the patterns and Jesus and was engaged for the whole lesson. Hannah having her morning tea outside the museum with her class. The thing that makes me really cross about all this is that there has been no attempt from the school to provide for Hannah's needs and no process. It has all been about us providing the teacher aid, collecting her at lunch time, trying to schedule meetings. They say that they haven't got the resources to cope with a child with special needs but they haven't even tried. We have been paying full fees for her to attend part time, surely they could have used some of those funds for resources or a specialist teacher to come and work with Hannah. 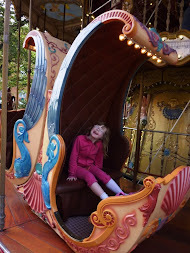 They accepted her knowing she had Down Syndrome and were always aware that there would be a bit of extra work involved in terms of differentiating the curriculum for her and having an IEP once a term, so I am very confused as to what has changed. The reality is that IST were failing Hannah. They refused to accommodate her needs even though they are able to and even though we tried to meet with them to discuss a timeline of progression and Hannah's needs I was constantly fobbed off and told they were too busy. The fact that Hannah was not allowed to stay for lunch was also a huge issue as Hannah was not able to further develop friendships. 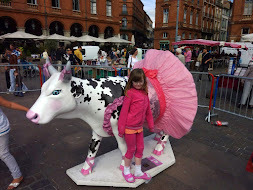 We are now investigating other schooling options for Hannah and looking at French school and there is also another bilingual school that I will contact. We hope to have something set up for Hannah for next term but as paperwork here can be a bit of a challenge it may be she starts school in September. My mum is here in June so we may just end up having lots of education outside the classroom - as long as it involves cafes Hannah will be happy! On top of all this James' plane has been delayed and is now due for delivery the week we were going to Portugal. So last week I had to frantically change all our travel planes. The plus side is that we are now going to Portugal on the 20th of April, two weeks earlier then planned. We are all looking forward to a rest and some quality family time.